I have decided that I will be starting a series which will explore the major teachings of Jesus in the Gospel of Matthew. There is a lot of gold to mine here, so we will spread the series out, one post a week. This running series will likely take the majority of the year. I hope that you will join me on this journey to learn more about what the Lord is telling us in these passages. It is important as we begin this series that we all understand a bit of the structure of Matthew's Gospel. Matthew's Gospel must be understood along two strands--the events of Jesus' life and the teachings of Jesus. The events of Jesus' life (pictured below in orange) are told more or less chronologically. Spread among the biography of Jesus, though, are several teachings of Jesus. Jesus' teachings have been accumulated by Matthew into six topical sections, and these are presented throughout His Gospel. 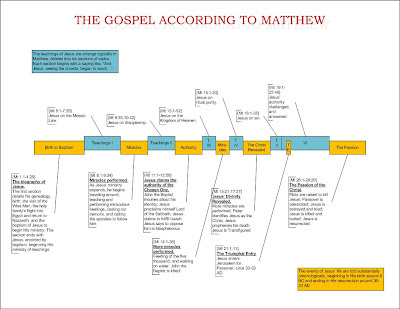 It seems likely that Jesus taught many of these numerous times throughout His ministry, not only at the chronological points in Matthew's story where they are topically arranged. Each section of teachings begins with a statement like, "And Jesus, seeing the crowds, began to teach...", and often ends with a statement like, "The crowds were amazed at His teachings...". This is important to understand, because often when studying verses out of context, we lose in our analysis the topic to which the passage is supposed to be referring--and thus miss its primary point. I created the graphic below to help illustrate the structure of Matthew, and we will use this as a guide throughout our teachings.